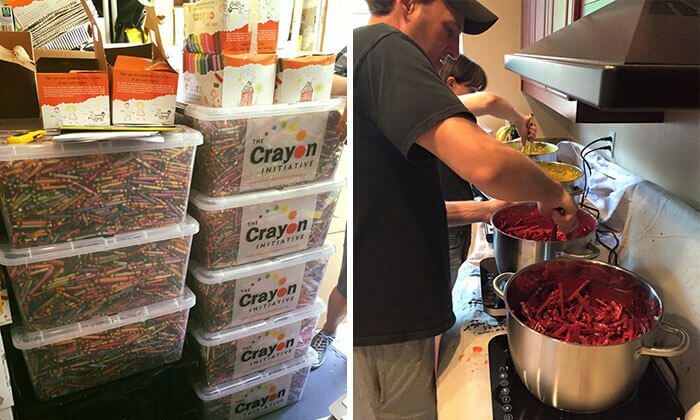 Bryan Ware, a father from San Francisco, noted that huge numbers of crayons are thrown out by schools and restaurants on a regular basis. So he decided to come up with a way to reuse them. Ware in 2011 was celebrating his birthday at a restaurant when a waiter brought his two sons crayons for drawing. In that moment, he wondered where the crayons went after they’re used up. His discovery resulted in him starting the Crayon Institute, which delivers recycled crayons to hospitals around California. According to Bored Panda, as much as 75,000 pounds of crayons–an astronomical figure–are thrown away by schools and restaurants. Ware then melts them down and pours them into special custom molds. “It is incredibly rewarding that our work is converting what would have been waste in the landfill into smiles on the faces of sick children,” said Ware earlier this month, according to ABC-7 News. His crayons are special, he added.